It’s the holiday season indeed! There are carolers singing under palm trees, 5th Avenue had the annual lighting of the Christmas Tree last week, and Gulfshore Playhouse has opened its third show of the year. The Holidays are here! As an early holiday gift, this week in the New York Times, Gulfshore Playhouse had its debut mention! 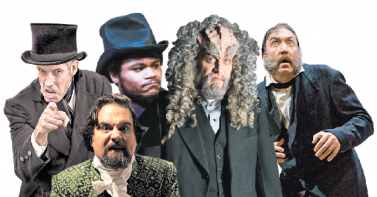 In a collage of Scrooges in the Times, an article entitled “A Season of Scrooges (And one SQuja’)” featured a prominent photo of our own Cody Nickell from JACOB MARLEY’S CHRISTMAS CAROL. These individuals are stacked like Jenga blocks across the page, and they reflect the unique characteristics of all of the productions they inhabit. What an exciting way to bring attention to all of the very talented actors across the country playing the intrepid role of Scrooge?! The article made me realize how fascinated I am by our show. On top of the absolute heartfelt beauty the production offers and the crazy amount of joy it brings, the show is a tour de force for Mr. Cody Nickell. He is incredible. I’m going to make a comparison he’ll hate: I went twice to Steven Spielberg’s LINCOLN last year. One time to watch the movie, and the second time to watch Daniel Day Lewis, who played Abraham Lincoln with such honesty that I needed a second viewing to admire his sheer talent. Well, Cody Nickell, you have yet another super fan! I’m coming back to watch Cody act. Just act. The end. And also to be overwhelmed by a story that’s bigger than me – bigger than all of us. I saw the show on Opening Night and I fully intend to be back this week and next in order to watch Cody’s seamless performance. How he connects each moment and makes every character unique from each other is beautiful, flawless and fantastically done. Kristen’s vision of this show is incredibly well-conceived. The moments come together to really grab us as audience members. This show sticks with you, folks. Like a warm bowl of oatmeal served at a comfortable Hobbit breakfast table. I cannot wait to see it again. We run through December 22, and you need to get a ticket before they’re gone. This is one you will regret missing, so please give yourself an early holiday gift and join us for JACOB MARLEY’S CHRISTMAS CAROL.